Today was the first time either one of us has left Blue Wing since we boarded her over a week ago. Greg took the dingy for a spin, which is technically off the boat, but not off of the water. 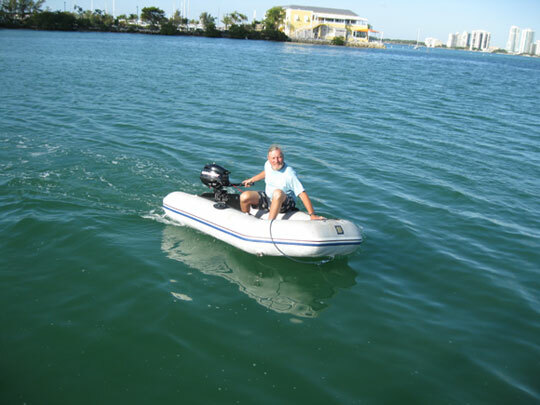 We found out the dingy still has leaks, but that our new outboard works great! We have been having troubles with our wifi booster, the WirieAP, since this past Thursday. The manufacturer and I have been emailing back and forth since Friday trying to determine the problem. We finally determined that itâ€™s broke. Soâ€¦ they want it mailed back so they can fix it and send us a new one. Of course if we were on land this would be easy â€“ and actually to my surprise it wasnâ€™t so difficult, although it did involve a trip to the hard. We hadnâ€™t really been able to determine much about our little cove where we are anchored beyond what we could see. But with the magic of my phone I discovered that there is a bus that comes close by and could take us almost directly to a post office. So we boarded the dingy and went ashore! Once we arrive in the Bahamas and settle on somewhere to stay for a while we will email the wifi booster company and ask them to ship the new WirieAP to us there, but until that time I am not sure how much we will be able to be in touch via internet. We were counting on the booster so we wouldnâ€™t have to go ashore every time we wanted to email or make a post. We hope to leave for the Bahamas sometime this week â€“ so, we should have more tales and what not soon and hopefully internet access to share it with all of our followers. BTW â€“ thanks for following! Your comments help encourage us to keep this blog going. This entry was posted in Florida on the Water, Life on the Water, Miami. Bookmark the permalink. Having said that, I’ll be VERY excited to hear another update from you once you’re connected again. 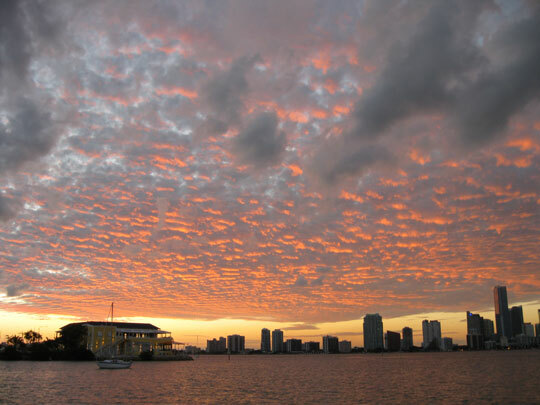 That Miami sunset makes it all worthwhile, doesn’t it? OMG, that water looks so inviting and what a gorgeous sunset. Hope the Internet issues get worked out soon. Eagerly awaiting more updates! The sunset looks awesome….good luck on your maiden voyage to the Bahama’s…look forward to your updates….